Native peoples have hunted, fished, and lived along the Kobuk for at least 12,500 years and it has long been an important transportation route for inland peoples. In 1898 the river was the scene of a brief gold rush called the Kobuk River Stampede, which involved about 2,000 prospectors in total. Hearing of gold along the Kobuk and its tributaries, miners set out from Seattle and San Francisco on ships to reach the mouth of the Kobuk. Upon arrival they were informed by native people that it was a scam, and only about 800 traveled upriver. The result was that little or no gold was found, and only on a few tributaries of the river. In 1980 the United States Congress designated 110 miles (177 km) of the river downstream from Walker Lake as the Kobuk Wild and Scenic River as part of the National Wild and Scenic Rivers System. The river is considered an outstanding destination for recreational floating. The Kobuk River Basin is located just north of the Arctic Circle and has a continental climate. The summers are short and warm, while winters are long and cold. The mean annual temperature in the middle and upper portions of the Kobuk Valley is -6 °C, and the mean temperature in July is 15 °C. An average of 21 inches (53 cm) of precipitation falls in the basin. However, actual precipitation can range from 15-40 inches (40–100 cm) with greater amounts falling in the upper reaches of the river basin. As a specific example, climate change will cause widespread thawing of permafrost in the discontinuous zone and significant changes in the continuous zone. Thawing permafrost can lead to a landscape of irregular depressions ( thermokarst) due to subsiding soils. This can alter drainage patterns and even change the course of streams; whereas other areas could become swamp-like. In addition, slope stability will decrease and permafrost degradation could lead to erosion of river banks resulting in an increase in sediment transport by the rivers. These physical changes will impact nutrient cycling and biological processes within the basin as well. The Kobuk River is a periglacial river, fed by a remnant glacial lake (Walker Lake) and mountain snowmelt in the Brooks Range. It cuts a channel through a landscape otherwise dominated by permafrost. The Kobuk's current form and structure is a direct result of several stages of erosion and channel formation following the last glacial retreat. Further down in the Kobuk watershed, the river worked in concert with the wind to create one of the more famous landforms in Alaska: the Kobuk Dunes. [ citation needed] These large sand dunes are the modern ancestor of alluvial deposits that became shaped and dominated by an exchange of aeolian and fluvial processes. In moister climates, the river has more water, and thus more power, and cuts down through a sandy bed. In times of drier climate, wind dominates and blows a lot of sediment into a weaker fluvial system, leading to aggradation and floodplain re-distribution. Currently, the Kobuk River in its middle and lower reaches is an anastomizing stream, with several braided channels in places, wide migrating meander bends, and oxbow lakes. It is controlled by yearly cycles of freeze and thaw, much like its surrounding landscape. For six months of the year, the river is largely still, frozen on top by a thick layer of ice. In the spring, warmer temperatures cause this ice to begin to melt. But the resulting process is not gradual. Rather, the pressure of melting ice from upstream builds up upon ice "dams" in the river's channel, eventually causing an "ice break-up" event, in which a flood of ice and water moves powerfully downstream. These annual spring break-up events have several important consequences. First, the river has deeply undercut and eroded banks, caused by large, fast-moving chunks of ice carving out the river's channel before it begins spilling out onto its floodplain, which is 1 to 6 miles (1.6-9.7 km) wide except at the confluence of major tributaries. Second, the river moves laterally very quickly and dramatically, re-inventing side channels every year as its secondary streams become drowned in each yearly flood by an overwhelming amount of sediment. Lastly, since the river is surrounded mostly by permafrost and because during the spring break-up event there are still large parts of frozen ground close to its banks, floods often transports large amounts of fine sediment across broad expanses of floodplain in thin sheets of water that slide easily across the frozen ground. These characteristics also translate into a relatively variable habitat for the Kobuk's native species. Flow records are available from USGS monitoring stations at Ambler and Kiana. Average annual flow for the Kobuk River at Ambler has ranged from 5,839 cubic feet per second (165.3 m3/s) to 14,890 cubic feet per second (422 m3/s) over the period of record 1966-78, with peak discharge ranging from 30,000 cubic feet per second (850 m3/s) to 95,000 cubic feet per second (2,700 m3/s). Near Kiana, average annual flow has ranged from 10,020 cubic feet per second (284 m3/s) to 24,960 cubic feet per second (707 m3/s) for the period 1977-99 with peaks of 45,000 cubic feet per second (1,300 m3/s) to 161,000 cubic feet per second (4,600 m3/s). Peak flows can result from large volumes of water released when ice jams fail. Flow records are also available for Dahl Creek, a tributary of the Kobuk River with a confluence near the town of Kobuk. ^ a b c "USGS Geographic Names Information System. GNIS Detail: Kobuk River". ^ Mann, D.H., Heiser, P.A., Finney, B.P, 2002. 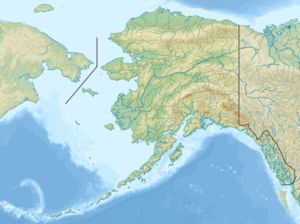 Holocene history of the Great Kobuk Sand Dunes, Northwestern Alaska. Quaternary Science Reviews, 21 (4-6). 709-731. ^ a b Anisimov, O.A., D.G. Vaughan, T.V. Callaghan, C. Furgal, H. Marchant, T.D. Prowse, H. Vilhjálmsson and J.E. Walsh, 2007: Polar regions (Arctic and Antarctic). Climate Change 2007: Impacts, Adaptation and Vulnerability. Contribution of Working Group II to the Fourth Assessment Report of the Intergovernmental Panel on Climate Change, M.L. Parry, O.F Canziani, J.P Palutikof, P.J. van der Linden and C.E. Hanson, Eds., Cambridge University Press, Cambridge, 653-685. ^ Koster E.A. & M.E. Nieuwenhuijzen, 1992. Permafrost Response to Climatic Change. Published in Greenhouse-Impact on Cold-Climate Ecosystems and Landscapes, Editors: M. Boer & E. Koster.